As patients of Seaside family dentist Dr. Scott Santos know, brushing ranks as the best practice for preventing tooth decay and gum disease. While this may seem like common sense, 25 percent of adults fail to brush twice a day, including 33 percent of men, and nearly 50 percent of adults say they don’t visit a dentist once every six months. These numbers indicate that millions of people fail to take proper care of their teeth, which is probably why over 178 million people are missing at least one permanent tooth in the U.S.
What might come as a bigger surprise, however, is that research has shown brushing your teeth offers even more health benefits other than preventing cavities and gum disease. To keep you motivated to brush twice a day, here are a few surprising reasons why brushing matters. A study published in 2011 by the American Academy of Periodontology found that periodontal disease – a severe form of gum disease – has links to respiratory disease. Researchers discovered that the bacteria most commonly associated with the disease could increase a patient’s risk of developing pneumonia. Fortunately, you can significantly lower your risk of developing periodontal disease by practicing quality daily oral hygiene habits like brushing and flossing. When practiced daily, these habits help prevent the inflammation that leads to the development of gingivitis – an early stage of gum disease – and subsequent complications like tooth loss and respiratory disease. If you’re like most people, the idea of brushing your teeth immediately after drinking a glass of orange juice probably seems fairly repellent. After all, minty fresh breath and citrus just don’t mix. But what you might not realize is how you can take advantage of this psychological association. Think of it this way, food and drink just aren’t as agreeable to your taste buds right after brushing, which means you’ll be less likely to snack, and more likely to stick to your diet if you brush after every meal. A study conducted by researchers at New York University’s College of Dentistry tested 152 participants to determine cognitive function later in life. The researchers discovered that a relationship did exist between participants that suffered from gum inflammation and cognitive decline. The study found that adults who suffered from inflamed gums were actually nine times more likely to score lower on IQ tests when compared to participants with healthy gums. 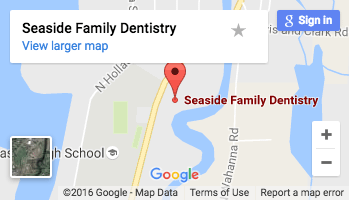 Your Seaside family dentist, Dr. Scott Santos, wants every patient to enjoy the very best oral health possible. Whether that means scheduling a dental exam, undergoing teeth whitening treatments or getting a cavity filled, don’t put off taking care of your oral health now in order to avoid more serious problems later. It’s interesting that brushing your teeth could actually help decrease your risk for pneumonia and other respiratory diseases. I think it makes a lot of sense that you breath through your mouth and nose so bacteria found there could leak back and enter into your body. Brushing your teeth and regularly visiting your family dentist would probably be the best way to ensure that you don’t get sick because of your mouth.